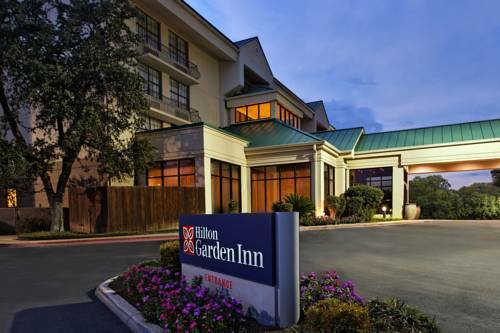 The Hilton Garden Inn San Antonio Airport hotel is located in north San Antonio just five minutes from the San Antonio International Airport with easy access to major Texas freeways. The hotel is just minutes away from the North Star Mall and a short drive to the famous San Antonio Riverwalk The Alamo Sea World and Six Flags Fiesta Texas. The Hilton Garden Inn San Antonio Airport hotel offers Texas size spacious amenity filled guest rooms and friendly service in a relaxed atmosphere. As part of the Hilton family the Hilton Garden Inn San Antonio Airport hotel offers exceptional quality and hospitality backed by **Our Best Rate Guaranteed. ** Our Hilton Garden Inn San Antonio Airport hotel features 117 guest rooms each with complimentary wired and wireless high-speed internet access with secure and convenient remote printing to our business center. Texas travelers will find convenient hotel room amenities such as a refrigerator microwave coffeemaker with coffee and tea hair dryer iron and ironing board and a 25 inch cable TV with On Command video and complimentary HBO. Our Texas business guests will enjoy two dual-line speakerphones with voicemail and data ports and a large work desk with convenient desk-level outlets adjustable lighting and ergonomic chair. Hotel amenities at our San Antonio Hilton Garden Inn include a USA Today delivered to your room each weekday morning a coin laundry facility and a complimentary safe deposit box located at our front desk. Texas visitors will have 24-hour access to our business center with fax and copy machines Dell PC readable CD-ROM color laser printer and complimentary high-speed internet access. Meeting and banquet rooms with audio/visual equipment are also available. After a busy day Hilton Garden Inn hotel guests can workout in the fitness center relax in the swimming pool browse the gift shop or purchase snacks microwavable meals and sundries in our convenience store. RESERVATIONS MUST BE CANCELED PRIOR TO 1600/4PM DAY OF ARRIVAL LOCAL HOTEL TIME TO AVOID A PENALTY OF ONE NIGHT ROOM AND TAX CHARGE. *NOTE-INDIVIDUAL PLANS MAY HAVE VARYING CANCELLATION POLICIES. Hilton Garden Inn*s classic American Grill with a variety of items. Real breakfast 24/7 including Join the Afterparty Grand Slam Getaway and refreshing chilling *Anything to cool off* beverages. At Last Extraordinary Gourmet Cooking for Everyone Brick Oven - Grill with southwest freshest ingredients. ~19 miles from San Antonio. ~74 miles from San Antonio.